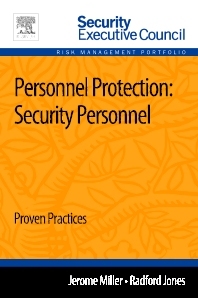 Personnel Protection: Security Personnel is a video presentation. Length: seven minutes. Jerome Miller is a military veteran with an extensive law enforcement background. He retired from the Detroit Police Department at the rank of commander, having served as the executive in charge of downtown operations. His duties included the design and facilitation of command post exercises and the revision of contingency plans for large scale field operations. His personal awards include the Detroit Police Department Medal of Valor. Miller has a B.S. in criminal justice from Wayne State University and a M.A. in public administration from Central Michigan University. After his retirement from law enforcement, Miller became the senior manager in charge of international and special security operations for Chrysler Corporation. Among his accomplishments while at Chrysler was the development and implementation of a corporate wide crisis management plan that represented a benchmark for the automotive industry. He has presented the Chrysler crisis management process at the World Conference on Disaster Management, the International Association of Chiefs of Police annual convention, and the American Society of Industrial Security annual convention. As a recognized expert in the field of critical incident planning and management, Miller has worked with Michigan State University on a Department of Homeland Security grant for the development and facilitation of tabletop exercises involving public and private sector partnerships throughout the United States. He has experience in evaluating executive protection coverage, performing physical security surveys, and conducting highly sensitive internal investigations. Miller is an alumni member of the executive board of the U.S. State Department’s Overseas Security Advisory Council, which was created by President Reagan to protect corporations and their personnel overseas. He is a former member of the American Society of Industrial Security, the International Association of Chiefs of Police, and was the chairman of the Michigan Security Police Association. Rad is an instructor in the School of Criminal Justice, Michigan State University. He teaches a master’s level course on public-private partnership issues in emergency planning and response and conducts university community outreach programs on crisis management and asset protection. Rad retired as the manager of global security & fire protection, Ford Motor Company, where he was responsible for investigations, executive security, security guards, security/fire systems, and crisis management. Prior to joining Ford he had a 20-year career in the U.S. Secret Service. He directed MSU - Department of Homeland Security grants in critical incident planning and response for communities and business and a law enforcement executive awareness program on weapons of mass destruction. In June 2000, he published the Critical Incident Protocol - A Public and Private Partnership. He has made a number of presentations and written articles on security and crisis management issues.